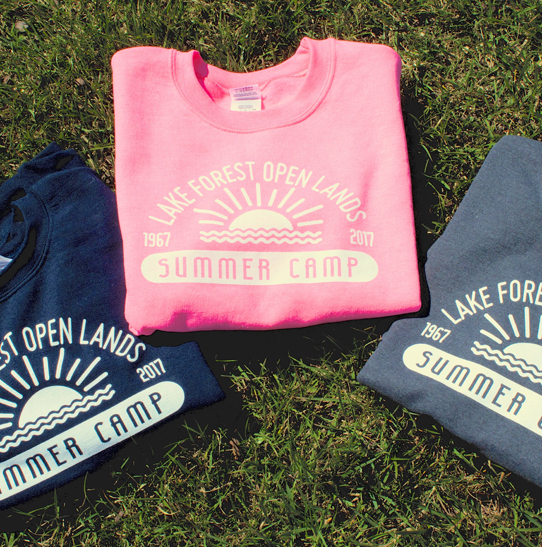 Don't miss out on feelin' groovy - get your one-of-a-kind, limited edition retro camp sweatshirt TODAY! Discover the wonder and awe of the natural world through the magic of literature! Each day campers gather for a nature story and trek outside to participate in games, activities and crafts that bring the story to life. Focus on a new sense each day to discover a fresh perspective on our habitats! There's something for everyone to invesitigate through crafts, nature play and plenty of exploration. Using an old map to guide them, campers will explore a different Lake Forest ecosystem each day. Through nature hikes, games and crafts, campers become immersed in the prairie, wetland, savanna, forest, lakeshore and more. After each exploration, campers get their "passports" stamped and makr their discoveries on the map. Campers will have so much fun they won't even realize they're learning! Explore the treasures of our Lake Forest ecosystems! Become immersed in the wide variety of habitats we have at our doorstep through nature hikes, games and science exploration. In canoes, on bicycles and by foot, our adventures take campers beyond the borders of our preserves while building outdoor leadrship skills. A camp-out under the stars caps this passport to adventure! Our most cumulative summer experience for 8th graders is not to be missed! Outdoor adventures will be kicked up a notch as campers travel beyond the borders of Lake Forest to study hidden environmental gems, such as the Indiana Dunes and Nippersink River. A variety of activites like canoeing, rock climbing and art projects will allow campers to develop their own individual connection to the land. A two-night camping trip to Devil's Lake as well as some extended days will allow for maximum exploration. Camp Refund Policy: Refunds requested by or on April 20, 2019 will be granted less a $30 service charge. After April 20, 2019 a full refund less a cancellation fee of 20% of the total camp fee is granted through May 10, 2020. Between May 11 and May 25 a full refund less a cancellation fee of 50% is granted. ALL REFUNDS MUST BE REQUESTED BY 5:00 p.m. ON LISTED DATES ABOVE. NO REFUNDS ARE GRANTED AFTER MAY 25, 2019. Camp Cancellation Policy: Camps will be cancelled one month before start date if enrollment is not met. Camp Refund Policy: Refunds requested by or on April 19, 2020 will be granted less a $30 service charge. After April 19, 2020 a full refund less a cancellation fee of 20% of the total camp fee is granted through May 10, 2020. Between May 11 and May 24 a full refund less a cancellation fee of 50% is granted. NO REFUNDS ARE GRANTED AFTER MAY 24, 2019. Camp Deposit Policy: Failure to remit remaining balance on or before due date is subject to removal from camp registration. Any balance due and owing after fees deducted from Refund Policy will be remitted to registrant.